Researchers have long believed that falling carbon dioxide levels drove the origin of plants with this innovation, but a new study in the Proceedings of the National Academy of Sciences, based on biochemical modeling by a group led by University of Pennsylvania biologists and paleoclimate modeling by a group at Purdue University, indicates that water availability may have been the critical factor behind the emergence of C4 plants. "The initial origin of C4, which happened when atmospheric carbon dioxide was still very high, seems driven by water limitation," says Haoran Zhou, a graduate student in the School of Arts and Sciences' Biology Department and first author on the paper. "Then later, about 5 to 8 million years ago, there's a large expansion of C4 grasslands. That's because carbon dioxide was getting lower and lower. Carbon dioxide and light intensity were actually the limiting factors favoring C4 at that time." "What we show," says Erol Akçay, an assistant professor of biology at Penn, "is that the increased water efficiency of the C4 pathway is enough to give it an initial ecological advantage in relatively arid environments. That's the benefit of doing this type of physiological modeling. If you were only looking at temperature and carbon dioxide, you might miss this role of water and light." The researchers' work also suggest that C4 plants may have had a competitive advantage over C3 plants even when carbon dioxide levels in the atmosphere were still relatively high, in the late Oligocene. "The inference is that C4 could have evolved quite a bit earlier than we previously thought," says Penn's Brent Helliker, an associate professor of biology who, along with Akçay, serves as Zhou's advisor. "This supports some molecular clock estimates for when C4 evolved as well." In plants with a C3 photosynthesis pathway, the first stable compound produced in photosynthesis contains three carbon atoms; in C4 plants, the first compound has four carbon atoms. The C3 pathway evolved first, functioning efficiently when the atmosphere was rich with carbon dioxide. However, C4 plants evolved independently from C3 plants dozens of times, able to photosynthesize efficiently in spite of lower carbon levels thanks to an extra step in the process that serves to pump carbon from the air into an internal layer of cells where the rest of the cycle runs. By running this "closed" system, where the photosynthetic machinery doesn't interact directly with the outside air, C4 photosynthesis enables plants to make more food with less water loss than the C3 pathway. Today, roughly a quarter of the planet's vegetative cover is composed of C4 plants. Several important crop species, including maize and sugar cane, possess the C4 pathway. Findings from the fossil record and isotope studies have helped scientists estimate when this pathway evolved, though these estimates have been later than those suggested by molecular clock data from phylogenetic analyses of various plant species, leading to some confusion about when the pathway emerged and when it came to dominate in certain ecosystems. To look closer at the factors that may have favored the spread of the C4 photosynthetic pathway, Zhou, Akçay, and Helliker created a multi-layered model. They considered variables that affect photosynthesis along with those that influence the hydraulic system, in which plants "decide" to either devote more energy into growing roots to take up water, or into building more leaf matter that can help take in light and carbon dioxide but also exposes them to greater water loss. In addition, plants can determine the optimal balance of carbon gain and water loss. Coupling these two systems, the scientists' model included four factors that could either favor the C3 or the C4 lineages: carbon dioxide concentration, light, temperature, and water availability. According to their model, C4 evolution appeared to play out in two phases. When carbon dioxide was still high, C4 emerged in areas of the globe that had become warmer and drier. But it didn't reap its competitive advantage over C3 plants until several million years later, when carbon dioxide was very low and the expansion of grasslands provided open habitats with ample light. In these regions, C4 grasslands expanded and replaced C3 grasslands. To see how this model interacted with paleoclimate in the early days of C4 plants, the Penn team collaborated with Purdue University's Matthew Huber, a paleoclimate modeler funded by the National Science Foundation to model Miocene climate, and graduate student Ashley Dicks. Using climate model output and paleoclimate data including carbon dioxide levels, temperature, and rainfall, the researchers predicted the likely geographic distributions for C3 versus C4 plants through the period from the late Oligocene to the early Miocene, roughly 30 to 5 million years ago. They found two regions that had not previously been identified where C4 plants would have been likely to dominate after first evolving, thanks to their water efficiency: northwestern Africa and Australia. "These are two previously unrecognized pockets of the world where C4 plants could have had an ecological advantage and really taken over," Akçay says. "It was a really exciting opportunity," says Huber, "when the Penn group reached out to us because this is a really novel application of paleoclimate model output. It helps make the connection between what climate models tells us about past and future climates and verifiable patterns from the geological record." "The climate conditions that were present when C4 evolved are possibly still important today," says Helliker. "If a lineage of C4 plants evolved primarily because of water limitations when carbon dioxide was high, then those plants may be found in dry environments today, whereas if it was more carbon dioxide that led to their evolution and dominance then those plants might be found in wetter spots today." 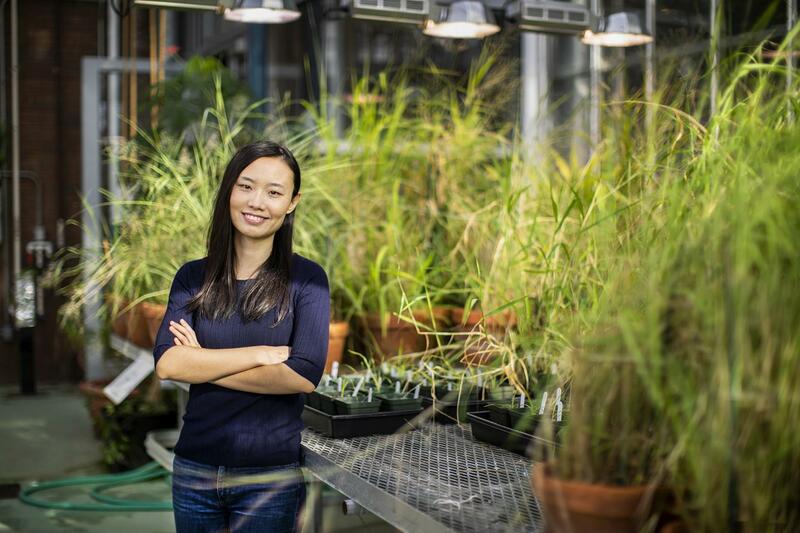 In addition, some scientists believe engineering other agriculturally significant species, such as rice, to have C4 photosynthesis, may help boost food production, so the model could help forecast where such plants could optimally grow.